How to Recruit Millionaire Matchmaker Style with JobScore? Some of Siilcon Valley’s best and brightest shared hiring strategies at HireCamp in San Francisco. The war for talent in the world’s tech hub is fierce and is increasingly demanding out-of-the-box thinking and creativity. You’ve probably heard of Box and their brilliant young CEO, Aaron Levie. If you haven’t, his Twitter account is a must-follow. 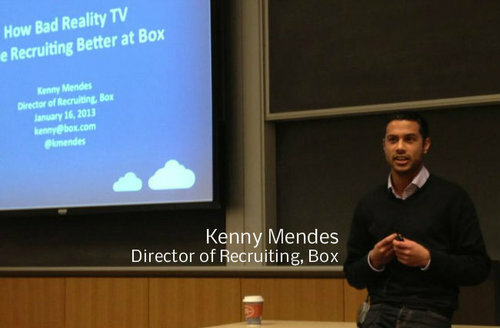 Enter HireCamp presenter Kenny Mendes, Director of recruiting at Box and a Millionaire Matchmaker. Let me explain. TV network Bravo has a popular show called The Millionaire Matchmaker. It’s essentially an exercise in matching rich guys with ladies who want to be with rich guys. Sound a bit like recruiting? You betcha. One of Box’s founders went on the show as one of the “rich guys.” Aside from the matchmaking, the national exposure for Box as a recruiting channel was exceptional. One of those candidates was Allie Covarrubias, who joined the Box recruiting team. Describing herself as someone who embraces risk, Allie convinced Mendes and Levie to run sales recruiting event that mimicked the mixers from the popular matchmaking show. Box also invited candidates who applied previously and told them it was an open event and to bring friends who might be interested in learning about Box. Moreover, recruiters performing passive candidate outreach used the event to start conversations. B-list actors were brought in to a swanky location. Candidates met with recruiters in a social setting that felt more like Happy Hour than an interview. They called it “Drink N Sync” – because Box helps you sync your files to the cloud. For the first 30 minutes the candidates get to know one another. This was done to relieve interview stress. Then, the candidates were taken into a room where they each had their own table. Company representatives sat down with the candidates in a round-robin format spending about 20 minutes with each candidate. In addition to being fun and viral, the strategy was embraced for its ability to simultaneously increase interview efficiency and quality in a high-volume hiring environment. A differentiator? You bet. Buzzworthy? Uh-huh. Effective? The results speak for themselves.